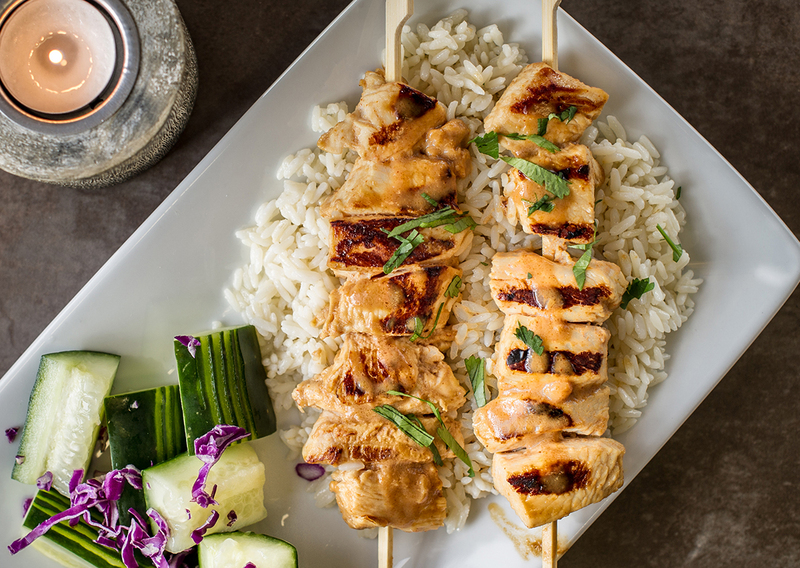 At your next barbecue, try these Thai chicken skewers. Great either on a bed of rice or vegetables but amazing stand alone too! Soak wooden skewers in water in a 9-inch pie plate for at least 20 minutes. In a re-sealable plastic bag, combine the cilantro, garlic, ginger, soy sauce and lime juice. Cut the chicken into 1-inch cubes and add to the marinade. Seal bag and shake to coat the chicken. Refrigerate 2 hours or overnight (Refrigeration time not included in Prep Time). Remove chicken from marinade and discard. Thread the chicken onto the skewers. Place the skewers on the preheated George Foreman grill horizontally and cook for 4 minutes or until a meat thermometer inserted into center of the chicken registers 180° F.
Arrange the chicken skewers on a platter, sprinkle with chopped cilantro. Serve with Thai Peanut Sauce.